1. Water as needed. On average, a lawn needs about one inch of water per week, from rainfall or irrigation. This will soak the soil to a depth of four to six inches, putting water deep into your lawn's root system. Letting the lawn dry out completely between waterings will encourage the grass to grow stronger, deeper roots as it searches for water deeper in the soil. For best results, water in the early morning when there is less wind and heat. Put a rain gauge on your porch to measure rainfall; if you receive one inch of rain in a week, skip the watering and save your irrigation money that week. 2. Fertilize naturally. Don't break your back trying to bag lawn clippings. If you mow frequently (about once a week during the growing season) and don't remove too much height, you can leave the grass clippings on the lawn. The clippings will serve as a natural fertilizer. They contain the same nitrogen, phosphorus and potassium as commercial fertilizer - and they're free. * Ready the ruler. Mowing your grass to the right height will help you create a low-maintenance, drought-tolerant lawn. Wait until your grass is three inches tall before mowing, and then cut it to two inches in height. By only trimming one-third of the blade length, you will avoid stressing the grass while leaving enough leaf to protect the roots from the sun. * Let a screwdriver be your guide. To see if your lawn needs to be watered, test for moisture by pushing a screwdriver into the ground. If it's difficult to push the screwdriver in, the soil is dry and your grass needs a drink. If the blade goes in easily, you don't need to water yet. * Use mason jars, vinegar and baking soda. Good soil is critical to a healthy lawn, and most turfgrasses prefer soil with a neutral pH (neither acidic nor alkaline). For a DIY pH test, pull out a pair of pint mason jars. Fill each jar about half way full with soil samples taken from several different locations around your yard. Be sure to remove rocks and other debris from your samples. Add a half-cup of vinegar to the first jar. If the mixture fizzes, your soil is highly alkaline and you don't need to test the other jar. If you get no reaction,continue the test by adding a half-cup of water to the soil in the second jar. Mix well and then add a half-cup of baking soda to the slurry. If this mixture fizzes, the soil is very acidic. Overly acidic soil can be amended with lime, while alkaline soil can be amended with sulfur. * Dish soap for the grubs. As your lawn grows, watch for brown patches that never turn green. Dead patches could be caused by grubs feeding on the roots in the fall. To determine whether grubs are indeed the problem, dig up square-foot sections of sod to a depth of about two inches in several areas in your yard. Next, examine the soil beneath your grass for short, fat, whitish C-shaped worms. If you find 10 or more grubs per square foot you should treat your lawn. To treat 1,000 square feet of grass, dilute two tablespoons of liquid dish soap in a gallon of water and spray it on the lawn, preferably immediately after a rainfall. This will cause the grubs to come to the surface, where you can collect them if the birds don't do the job for you. Repeat the treatment weekly until the grubs stop surfacing. 4. Maintain your mower. Take 30 minutes to service your lawn mower at the beginning of the season. Changing the oil, cleaning or replacing the spark plug and changing the filters once a year will help you avoid repair bills down the road. Also sharpen the mower blade if needed. 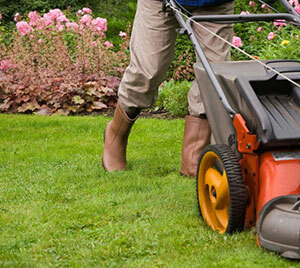 A dull blade will tear the grass rather than cutting it, which will stress the lawn and leave it vulnerable to disease.